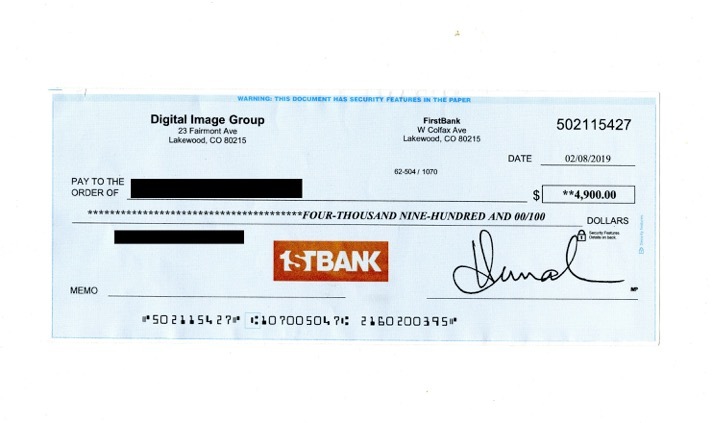 A new scam has been making the rounds with photographers. I’ve pasted the full text below so it will show up in searches. It follows scams in the past where they overpay then ask you to deposit the check then send part of the payment to other people or even return part as an accidental overpayment. It sounds like the scammer in this instance is posing as a producer and meeting up with photographers to collect the deposit for talent. The checks take a while to get rejected by your bank and so it’s too late by the time you’ve paid the producer or talent out of your own pocket. Be careful out there. I’m Michael, a fashion and lifestyle writer and editor at Wmagazine.com. I saw your profile on workbook.com which led me to some of your work online and after going through your portfolio, i would like to learn more about your services. I am working on a new project for the new year and I’m compiling shots for www.wmagazine.com “fashion page” segment and would love to collaborate with an experienced photographer on genre such as beauty, vintage, art, lifestyle, and outdoor. As the photographer on this project, you will concept, shoot, and produce 24 images, featuring 2 models. You will be required to work with a hair/makeup artist and a wardrobe stylist, and bring a smart, fun approach and distinct style. Please check the link below for some samples of my previous work and the attached PDF for full job description and let me know if you find the project interesting and would like to know more. I’m Jason, a fashion and lifestyle writer and editor at Departures.com. I saw your profile on workbook.com which led me to some of your work online and after going through your portfolio, i would like to learn more about your services. I am working on a new project for the coming year and I’m compiling shots for www.departures.com “fashion page” segment and would love to collaborate with an experienced photographer on genre such as beauty, vintage, art, lifestyle, and outdoor. 1. You will be required to work with 2 models (male & female), H/MUA and a wardrobe stylist. 5. Photographer’s compensation: $2,300 ($800 upfront; and $1,500 balance payment). 5. Images delivery deadline: January 15th, 2019. 2. Produce focused images for use online. As the photographer we want you to handle other aspect of the gig and dictate the creative direction. If this seems like a project you would like to work on, please reply for more details. I just had this happen to me and its exactly the same except the client was Refinery29. I eventually figured out the shenanigans by contacting the DOP and she of course confirmed it was BS and its happened to other photogs. The “editor” puts you in touch with the “talent agency” that is going to provide models, HMU and wardrobe stylist. This “agent” is actually the same person as the “client” and the scam is that they require the full $4100 before the shoot day, then no one shows up. Not surprisingly the website is under construction for maintenance. This has to be someone in the business that generally knows how things run. So utterly disappointing that someone would do this. Sadly, I’ve received this same scam in so many different iterations with similar copy. Even once from “Edward Enninful of Vogue” – Ha. A have received a similar message. Budget over $100K and a widely known editor name. Called the editor’s office in LA first. They were already busy with calls from other photographers who got the same message. Alerted my ASMP chapter right after. One of the photo gear bloggers mentioned a photg scamed that way last year. He wired $8000 of talent fees to a fake talent agency but was able to recover his it. Scary. Always research and if it does look to good to be true it probably isn’t. Just how the email is written smells fishy to me,. It’s too generic. Whenever I receive an email for a job either I know the editor or art director, or the person inquiring typically includes something specific as to why they are interested in hiring me. Yep. I got one from Sandy Holmes @ Marie Claire. Instant red flags lol. Scams have been going on w me for a year now, very similar to this. Mine are always a “Ralph Lauren” shoot, and the irony of that is I don’t shoot fashion. Couple of redflags right off…. 1) . There’s no way a Departures editor or producer would ask for “professionally photographed High Res Digital Copies” It’s a given they would be professional since YOU ARE A PROFESSIONAL and they are a well known magazine. 2) 1080p is a motion term, not a stills term. No one is asking for 1080p still images. At least no one legitimate. Another Refinery29 one sent to me. Kenneth Partridge was the editor name they used. And Shawn Barton was the supposed talent agent. I caught on immediately and emailed the Photo Editor at Refinery29 as well as the real Kenneth Partridge, and of course they both confirmed it was a scam. I played along up until the day before the “shoot” just to collect info to pass along, and because it was kind of amusing to feel like I was playing them. They do seem to have a lot of correct jargon, but then there were things that were very clearly not how most of us do business. The magazine has a team of photo editors, and instead I’m being contacted by an editor/writer (and that any writer would have such poor grammar). And when was the last time a talent agent cared about scouting shots or planned on attending a shoot? I never pay talent in advance, nor have I ever been asked to. It’s just a variation of the wedding photographer scam going around. Sad! This has actually been going around for years. The price has gone up but the wording is the same. It wasn’t hard at the time to filter it as a scam since no other prospect I ever had approached me in this manner. Perhaps they’ve gotten better. I posted the warning on social media about 2 years ago. I’m glad to see others are posting this but sad that it is getting worse. Our profession is hard enough; no one needs this crap. I hope they’re caught. Yep, happened to me, too. Mine was from Sally Holmes from Marie Claire. Almost identical email to the one posted above. She instructed me that I would pay Brian Ortiz of “Fusion Talent” at the photo shoot. Total Crap. Beware!! !